Well it's getting close now, excitement is in the air. 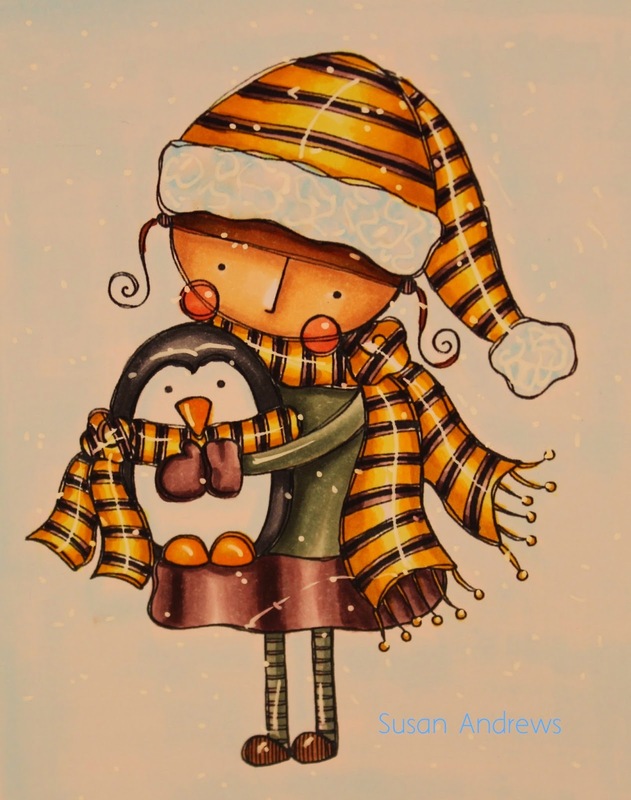 Not only is it a time where we can take in all the hustle and bustle of preparing for the holidays, meeting up with family and friends but we open our hearts and wish well to others. So, here's to a very Merry Christmas with good health and prosperity. My project today consist of several images from Megan Suarez, she has a unique style that ranges from simple and sweet to off the wall and a bit morbid. 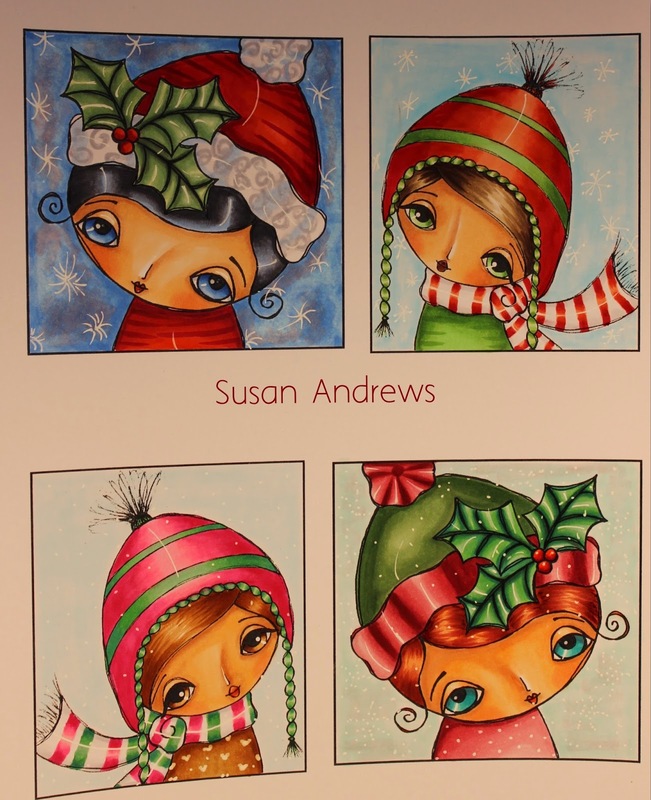 I chose to use the simple and sweet images to colour, an array of winter girls which rounds out the season of crafting. 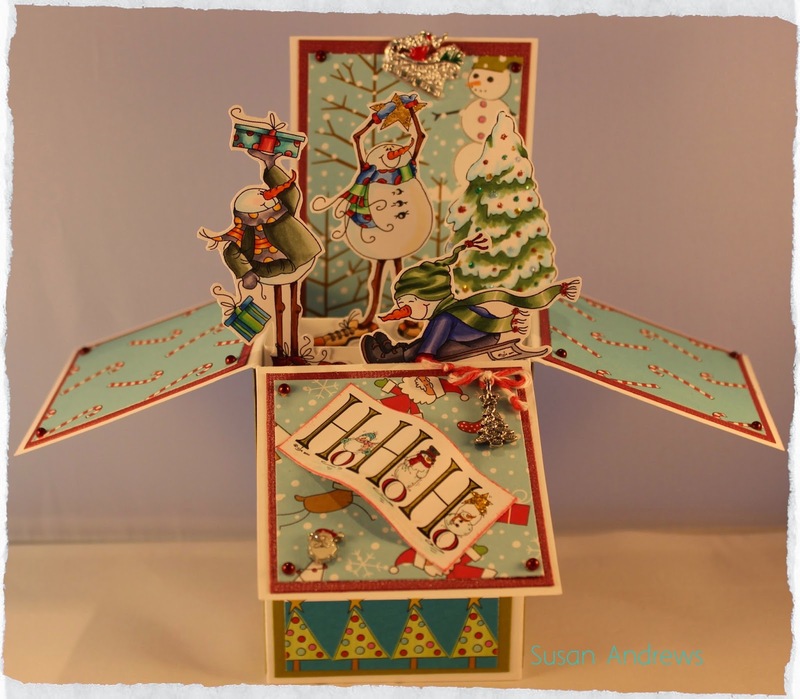 Today's project is not in the seasonal Christmas theme but a get well card. Fortunatly for me it is not a card that I often need to make. 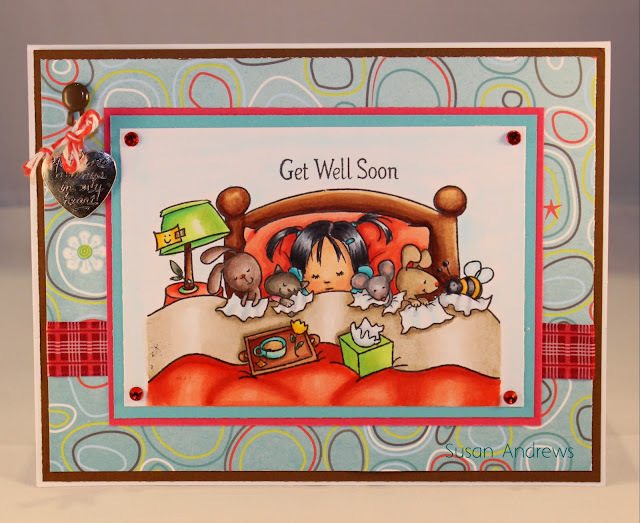 Although, since I am in need of one, this adorible polymer stamp set Sniffles and Snuggles from Sugar Pea Designs came in handy. They do look cozy snuggled in their warm bed, besides there is a nice comforting tea waiting to be enjoyed. 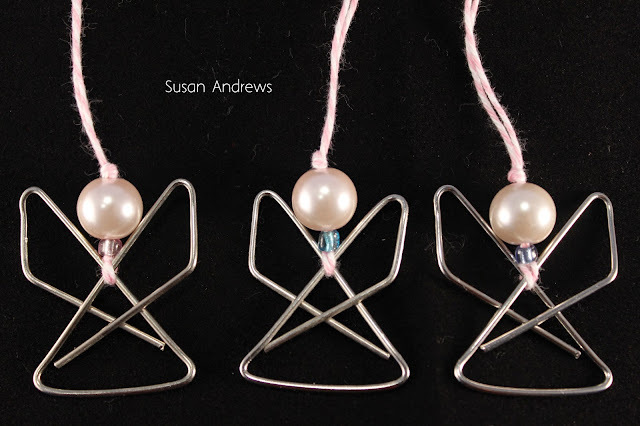 Today I have a simple angel ornaments to share. 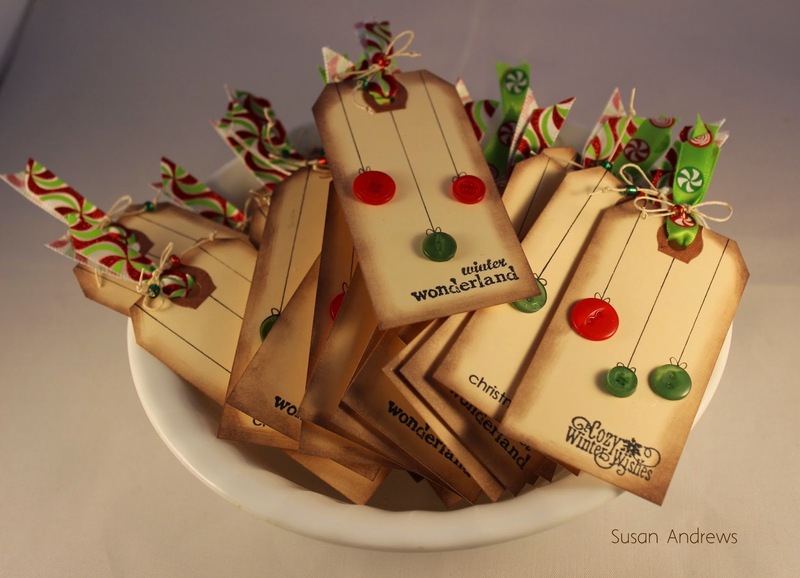 These are not only quick to make but they look great as an accessory to a package, hanging on the tree or as a small gift for a friend, the possibilities are endless. As can be seen the body consists of a heavy duty paper clip, the head is a round bead plus a smaller bead for the neck. Put this all together with a piece of bakers twine and a cute little angel emerges. 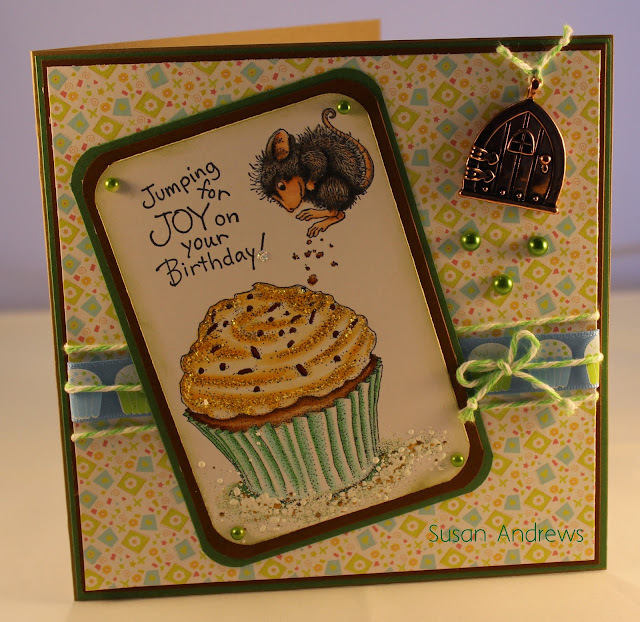 Today's sweet card was made for my adorable grandson using the House Mouse Desgin Stamp, Whee Flight. This little mouse looks like he could get into all kinds of micschief, making it a perfect image for a little boy. The super shiny background paper, embossed snowflakes plus the glittery punched out star completes this cards cheery, festive look, while at the same time keeping it simple yet fun. It's the most wonderful time of the year! I must say I am super stoked to share with you all, this years Christmas card. 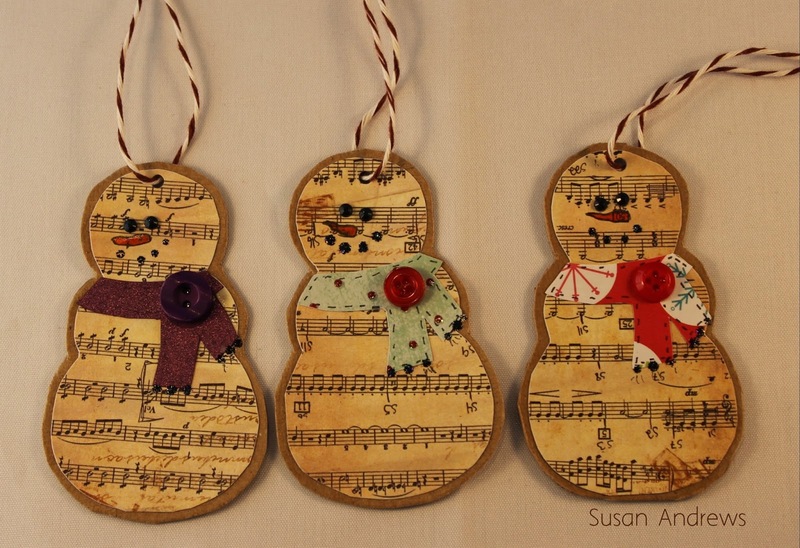 Not only is it adorable but it was so much fun to create. 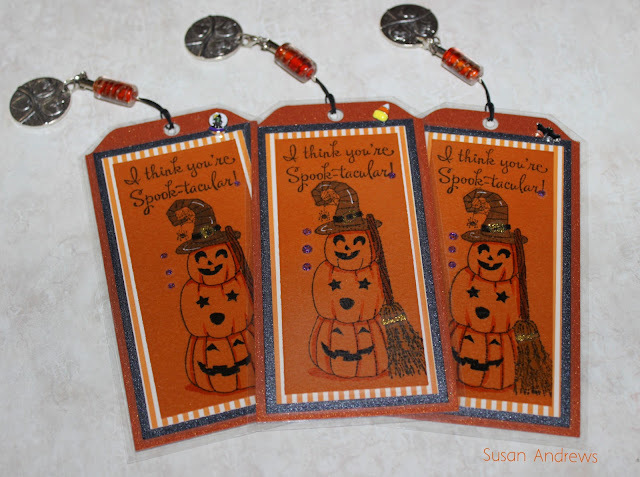 Once again the images are mostly from Sassy Cheryl's digital stamps. She has such a wonderful collection of snowmen to choose from. 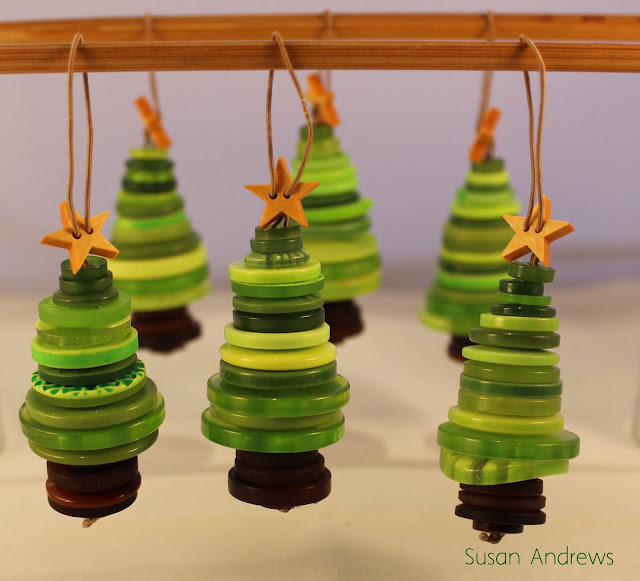 Along with Cheryl's images the perfectly shaped Christmas tree comes from the talented Zoe at Make It Crafty, these gals certainly keep the creative juices flowing. As for the design I chose to go with the popular box card which allowed me to create a dimensional design while using several images. 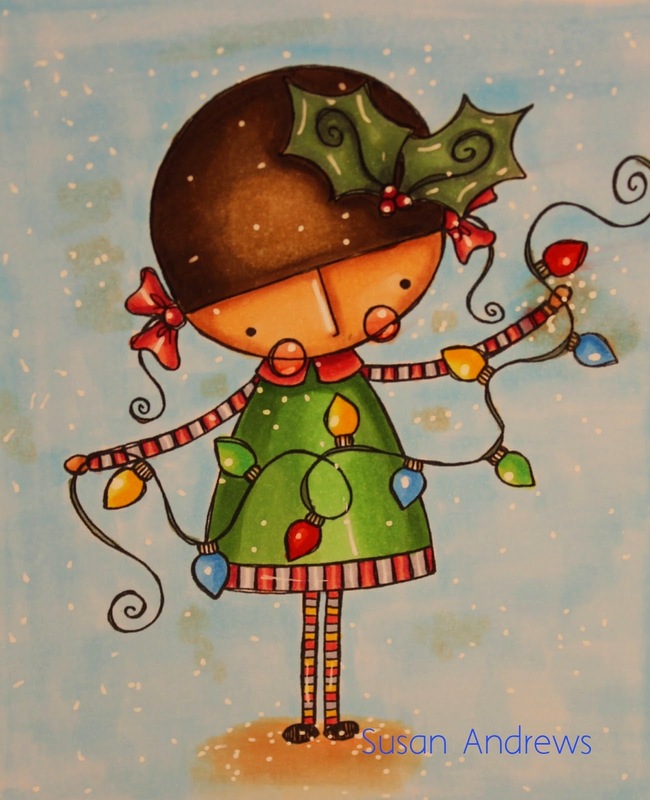 Finally, finishing touches were added by using some sweet Christmas charms. Overall I am very pleased with the outcome. 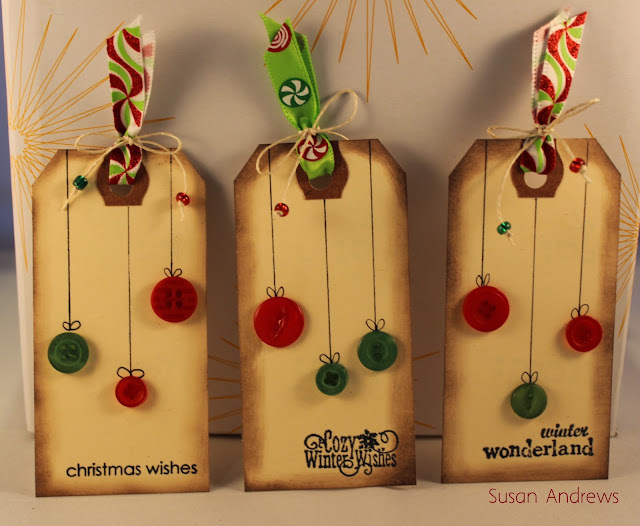 Today is a simple and fast project which was inspired from some tags I picked up while visiting Granville Island in Vancouver, Canada. 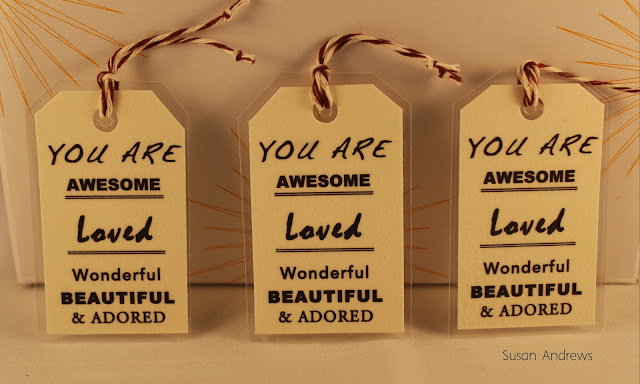 These little tags make a perfect random act of kindness item, a pick me up for a friend or a nice addition to finish off a gift. Well the spookiest night of the year is fast aproaching, when all the ghost and goblins will be out and about. Although halloween isn't a particular event I get overly crafty with, this year I have managed to create a few items. 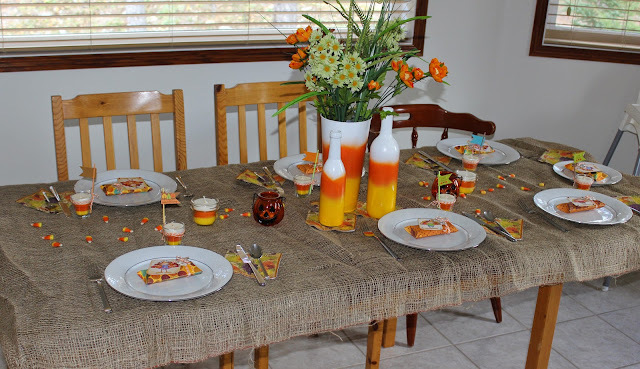 As previously seen was my table with the candy corn candles and vases, which not only went with the Thanksgiving theme but doubled as halloween decorations. 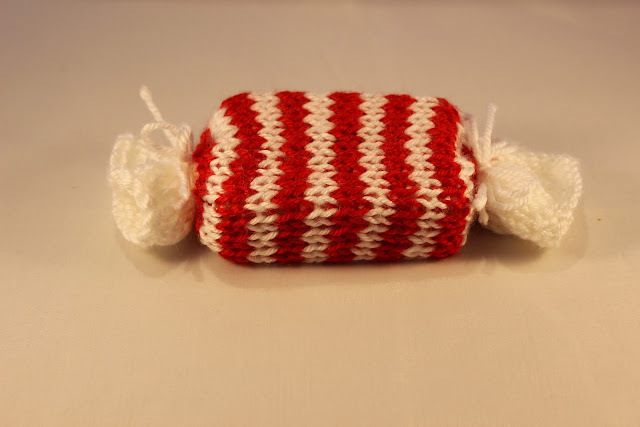 Next up is this cute bag which my daughter decided we should make. 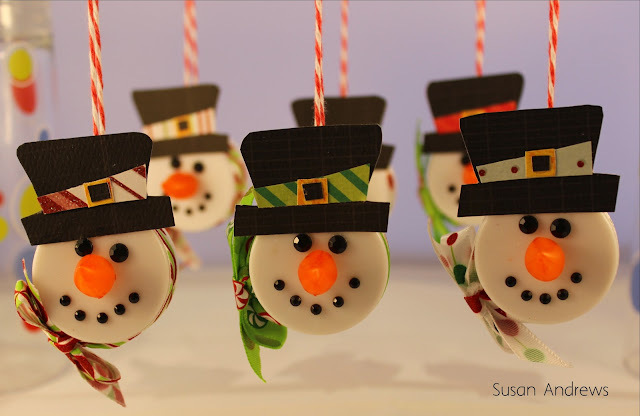 Not only are bags a great way to bring in the seasons celebrations, but they are friendly on the environment. Hence along with the adorable fabrics, bright coloured buttons plus an added bow we created this unique yet super fun shopping bag. For us in Canada Thanksgiving was this past weekend. Not only was it a spectacular weekend with the fall colours ablazed in golds, yellows with a splattering of red, but the weather was warm, sunny and for us no snow. Yahoo!! On top of that we were fortunate to have some company giving me the opportunity to once again be creative. With that being said there is no better way to express creativity than decorating a table. Consequently today I am sharing my table along with three new projects plus one I showed the other day. 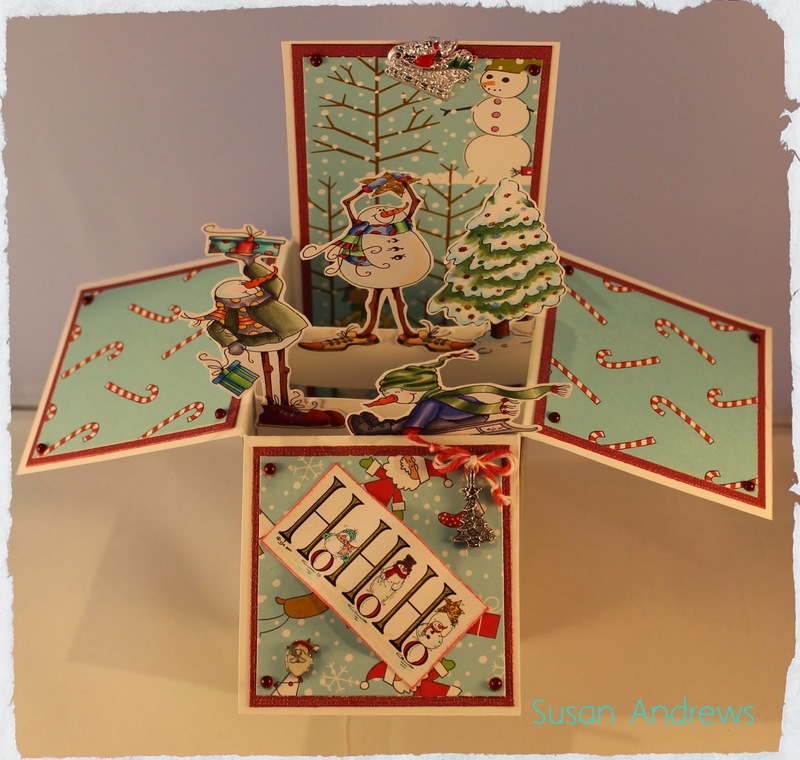 First off is the adorable name card treat boxes created yet again from a couple of fun images from Sassy Cheryl. 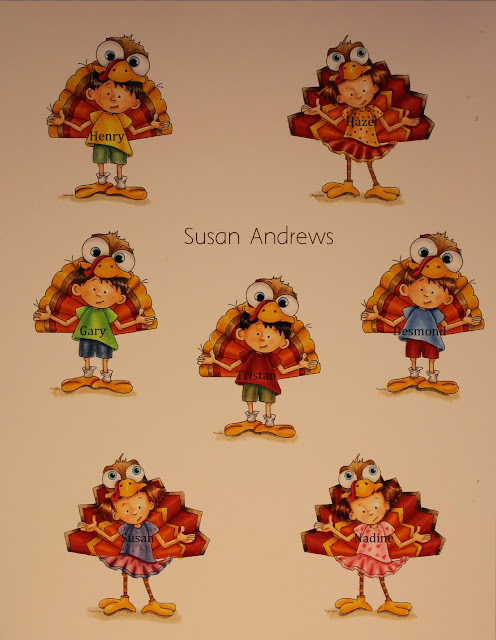 Brightly coloured images of Sally and Noah sporting their turkey costumes made for the perfect feature on the pillow boxes created from my We R Memory Keepers pillow box punch board. Add to this the name of each guest then finishing off the box with a bit of bling and some bakers twine. Next in the line up is the personal soy candles with little thanksgiving flags. 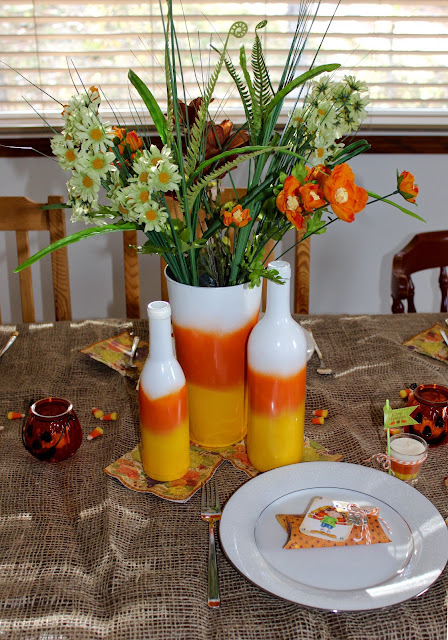 My daughter and I had so much fun making the last candy corn candles (which are also adorning the table), we decided to create a smaller version using small glasses purchased from IKEA. Finally, paint spraying a couple of wine bottles plus a tin vase in the candy corn theme rounded out our Thanksgiving table decor. As you may recall to my being on a Sassy Cheryl run, well, Noah playing soccer for "The Game Is In The Player," lines up for todays card. Sporting his new fancy soccer ball bling he is ready for action. Although, I do realize in the world of cards mine are pretty clean and simple, making it important to have just the right bling bringing it all together, at least that's what I tell myself. I have a super fun project for today. 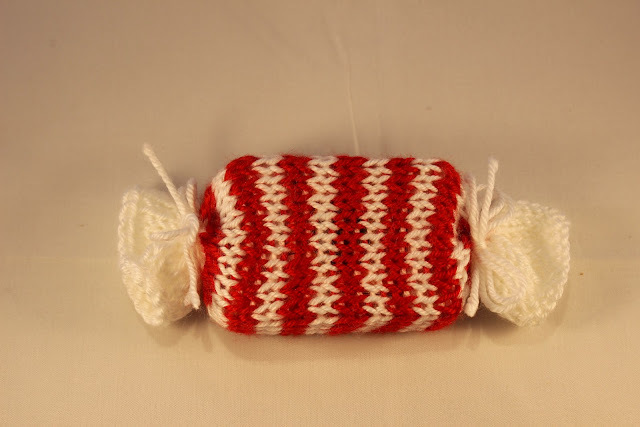 Recently my daughter and I got together to work on a few items for the Christmas season. 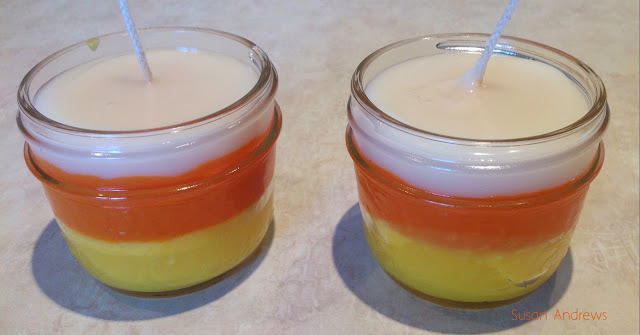 In our midst of the projects she suggested we make some Candy Corn candles for Halloween. Although the method of candle making is relatively the same as when I made candles with mom, many years ago, a few of the supplies have changed. No longer were we needing to peel crayons to melt for the colour, we simply added a few shavings from a highly pigmented wax colour block. Another change was the metal base you attach to the wick, this not only helps to hold the wick to the bottom of the container, but also keeps it in the center, allowing the candle to burn even. Next was the choosing of the wax. Although there are several different options to choose from we chose to use a soy based wax. Not only did this allow us the nice white top layer but it also kept the other colours pure. Finally, we added a hint of pumpkin spice fragrance, not too strong, but as a subtle undertone, I do prefer my candles to be scent free. It's Birthday time! Not only do I love celebrating birthdays, but recognizing a special birthday is even more fun. It just so happens that today is my father in-laws 80th birthday, an age worth honouring indeed. Coupled with the fact he is healthly, strong and able to enjoy his senior years without restriction. So, here is to a fun filled birthday with lots of cheer and well wishes. Today's image is from the talented Sassy Cheryl, who not only has a wide array of images and also the oldies but goodies section where several of her images are grouped together for one great price. Cupcake Fun is one such set with three included, a hungry but cute bear as shown here, a sneaky little mouse, plus the delicious cupcake on its own. What a fun set. 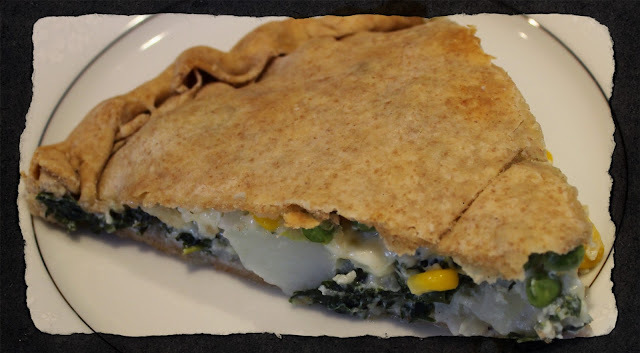 Today's tasty recipie is a flattish pie that comes from the Liguria area in Italy. 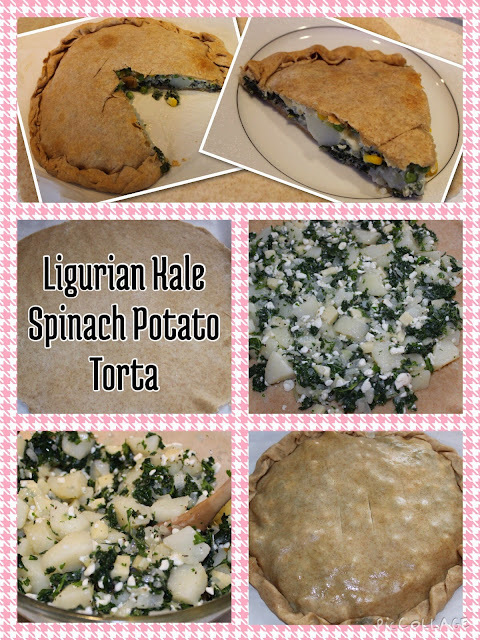 The amazing recipe for this particular Torta came from "The Book of Kale" by Sharon Hanna. Sharon has some great recipes in her book that are well worth checking out. 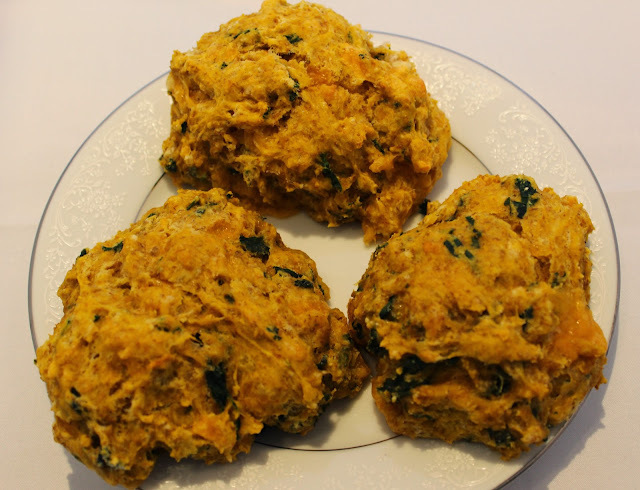 Although the original recipe called for chard instead of spinach, feta in place of the cottage cheese, as well as a few other minor changes today I am going to post the recipe as I have made it. Fortunately the wonderful thing with cooking is most recipes can be adapted to your own taste. note: I added some frozen corn and peas to the filling this time for extra vegetables. Crust: Mix together dry ingredients, drizzle oil over top add butter, then combine well with fork. Sprinkle water on a little at a time, adding up to a maximum of 1/2 cup (125ml), to form a soft dough that just holds together. Kneed the dough for about 30 seconds, then wrap and refrigerate for at least an hour. (You can make the crust in advance and store tightly wrapped in the refrigerator for up to a day). Filling: Mix cheeses, potato, sautéed onion and parsley in a bowl season with salt and pepper. Cook the greens in a small amount of water until al dente. Drain in a colander, squeezing out as much liquid as you can. Let stand then squeeze the greens again so you don't end up with a soggy torta. Add the greens to the cheese/potato mixture. Season to taste depending on the saltyness of the cheese. Stir in the egg and 1 Tbsp (15 ml) olive oil. Preheat oven to 375* F (190 C). Remove the dough from the fridge and divide into two portions one slightly larger than the other. On a slightly floured surface, roll out the slightly larger ball to an aproximately 13" (32cm) circle, turning dough occasionally. It doesn't need to be perfectly round, in fact it looks more rustic and authentic if it's a bit wonky. Place the bottom crust on a tray lined with parchment paper. Gently pile filling on top, spreading out while leaving a 1 inch (2.5 cm) edge without filling. Now, roll out the top crust (which will be slightly smaller) and place it on the top of the bottom crust and filling. 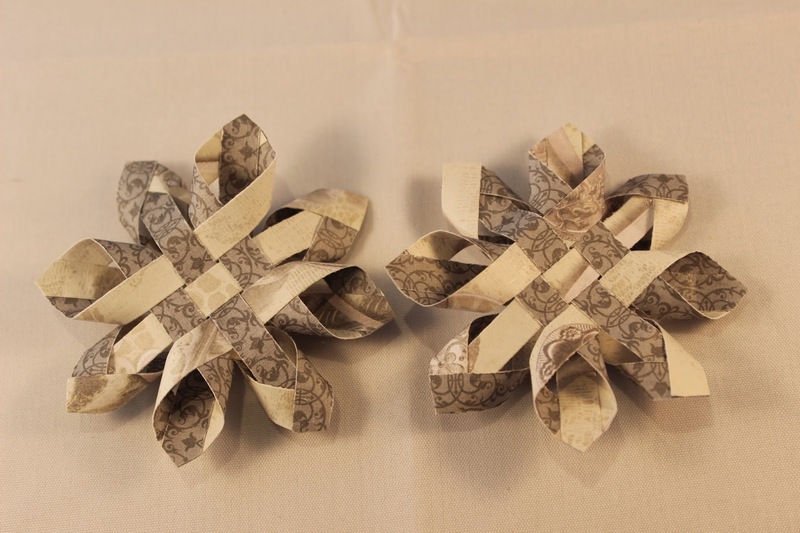 Lightly moisten the bottom edge, then fold and crimp with your fingers. Pierce the top here and there to allow the steam to escape. Brush or drizzle the top with the remaining olive oil. Bake until pale or golden, about 30-35 minutes. Enjoy. I hope you take the time to try this delicious dish it really is yummy. It has once again been awhile since I created a post. It seems that the crafting bug has up and left. Hopefully with fall fast approaching my crafty sences will kick in and the many ideas and projects floating in my brain will come to fruition. Furthermore, it would be nice to finish up the half started projects sitting on my table. With that said here is to a fun filled creative fall. 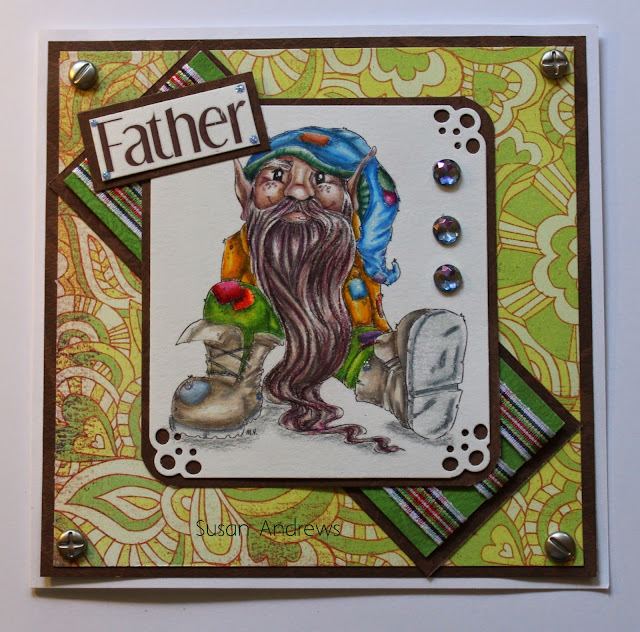 The project for you today is a card I created for my husbands birthday. It is a wonderful image I found on Deviant Art, once again from the very talented Jade Dragonne. Jades wonderful yet diverse images work well for many occasions, all the while finding an array of designs to match your colouring abilities. This particular image worked well for my husbands card, most men like beer, plus there is nothing better than a cute barmaid to serve them up. Finally, it gave me the opportunity to practice colouring glass, fluids and countertops. A great combination indeed. Before I head off for some summertime fun I thought I would share my latest creation. Unfortunately, I am unable to place where I bought this fantastic digital image from. Although that might be the case, as I was going from site to site looking for this particular image I happened to come across some georgous fairy images at both "Crafts and Me" plus "Sweet Pea Stamps" they are certainly worth checking out. As for today's card not only did the colour combination come together beautifully, but the artist (unnamed for the moment) created a fantastic image that was a joy to colour. Finally, the finishing touches of I love to read, tree of knowledge and a pretty flower charm brought this card to completion. It has been awhile. Even though I have missed colouring and being creative It seems when you become a grandparent all else falls aside, consequently my focus has altered. I must say that my grandson has stole the heart of his grandma, all the while being super cute and adorable. Well enough of that and on to my card. Club kid from Kenny K is yet again another fun image to colour. Not only does this gal know what cool is all about, she totally rocks the torn jean look, which is not always easy to do (besides if they were in my closet would have been in the trash). Furthermore, I'm sure that this image will get coloured up often being adaptable to many different occasions. Today's a post Father's Day card. While most fathers have received their cards, my father inlaw was on vacation enjoying beautiful weather, time with family and not to mention the beach and lake. With that being said this card is the perfect reminder of the great time they had. Not only does Sunny the Turtle from Kraftin Kimmie stamps enjoy a float on the lake, he is also a great fan of sun screen which protects himself from those harmful rays. Furthermore, this was fun to colour, while getting to practice reflections and water. Well the last of the new arrivals has made his way into our family. Once again I have used the Geeky Couple had a baby from Make It Crafty. These images work very well with the box card design. 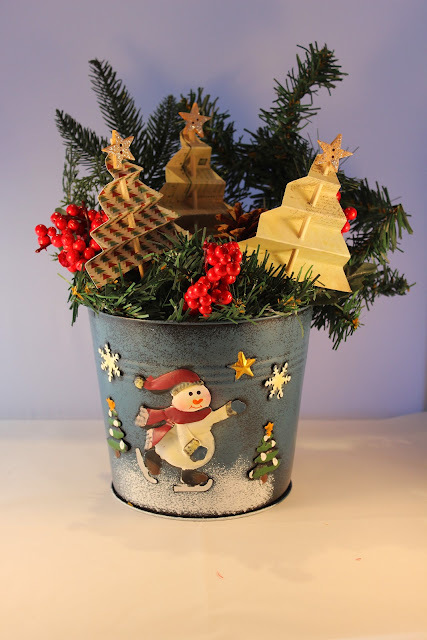 In addition the colour combination blue and brown made a wonderful choice for a baby boy. Finally, I added some floating charms and a cute baby shoe dangle for the bling. All in all I love how the card turned out which I am sure will be well received. As for the bling, a friend is now selling the living lockets, charms and many other wonderful items. I will be sure to post a link when her site is up and running. Meanwhile, I will continue using some on my cards adding an unique aspect. 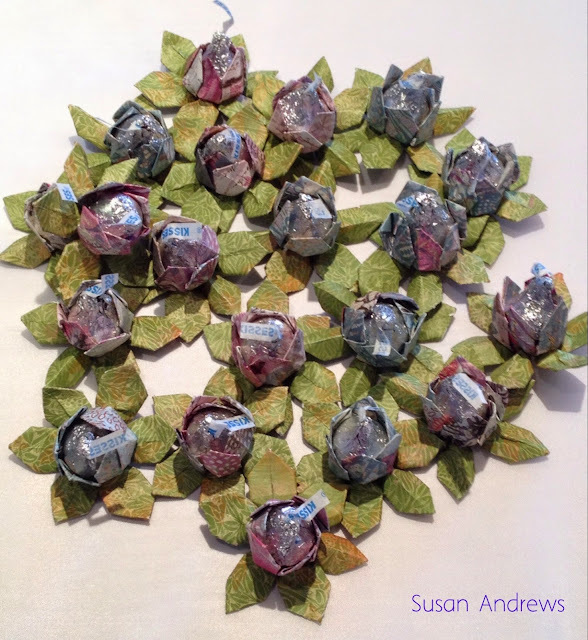 These wonderful origami lotus flower candy treats were a great hit with the girls for our women's wellness windup get together. 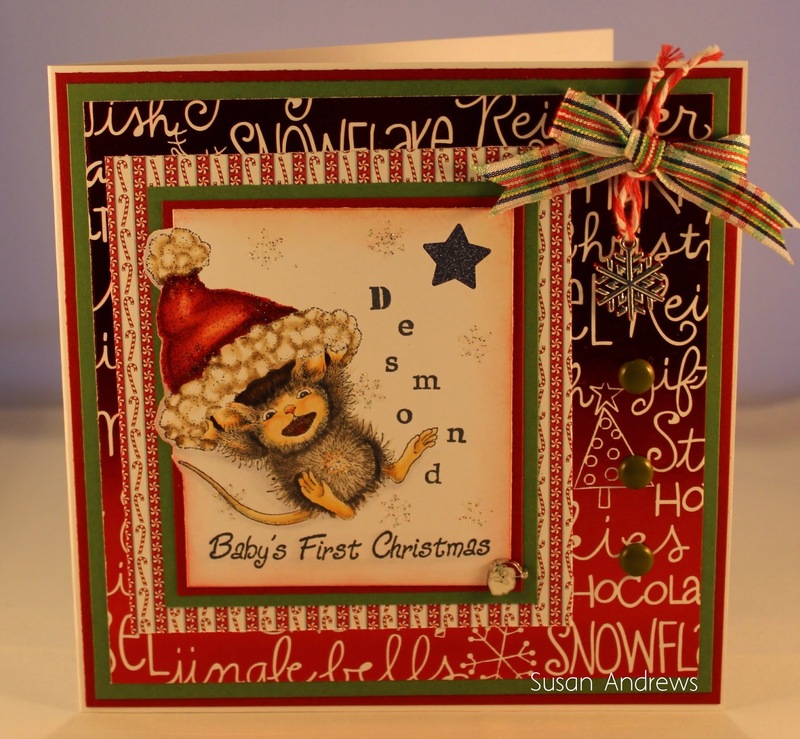 Not only did "Tanya Bell from Stamping T!" 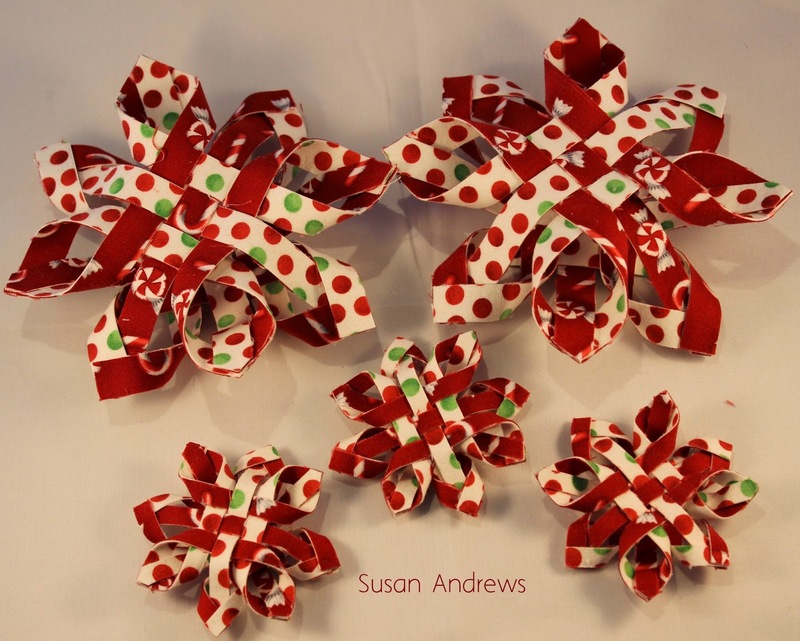 come up with an amazing fun project she also provides an easy to follow YouTube video. 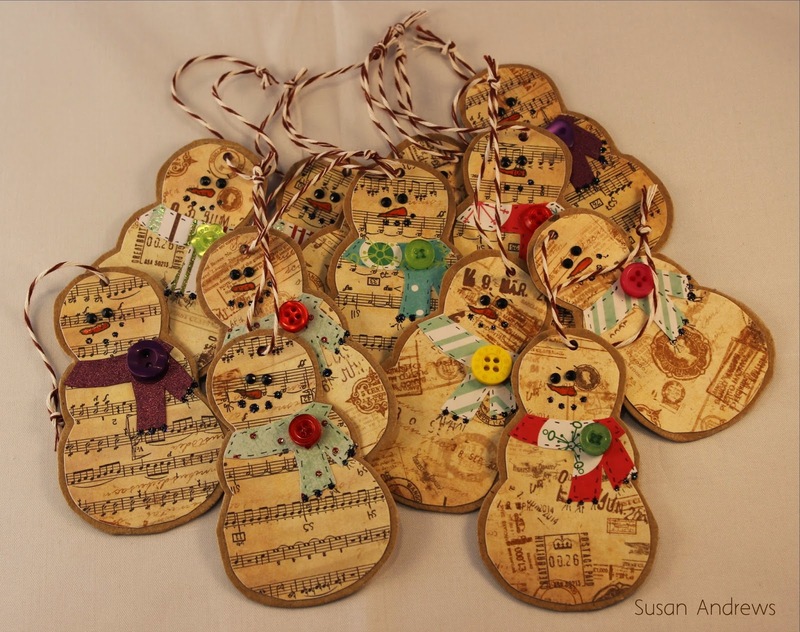 The crafting community is fantastic, most crafters are excited to share and teach, while giving the opportunity for others to experience their creative endeavours. It really has become a worldwide family which I am thankful to be a part of. First off I would like to wish a Happy Father's Day to all dads. Such an important role you play in our children's lives, from coaching sports, supporting the family, and being that strong yet compassionate role model, thank you. Next, one of the things I like to do in the evenings while I am away is to colour. I usually pack along my Copics with several printed digital images, this time however I brought along my Prisma Coloured Pencils. Printing this wonderful gnome from Make It Crafty on Stone Henge paper provided a slightly larger space to practice shading. At this point I find colouring with Prisma pencils time consuming, although very enjoyable. Wow, isn't it amazing how busy our lives can get! That has been mine lately. Anyhow, it has been a joy getting back to crafting and sewing. Too long without creating is not good for my soul and can leave me feeling depleted. With that said I have a few things in the works that will be completed and shared soon. 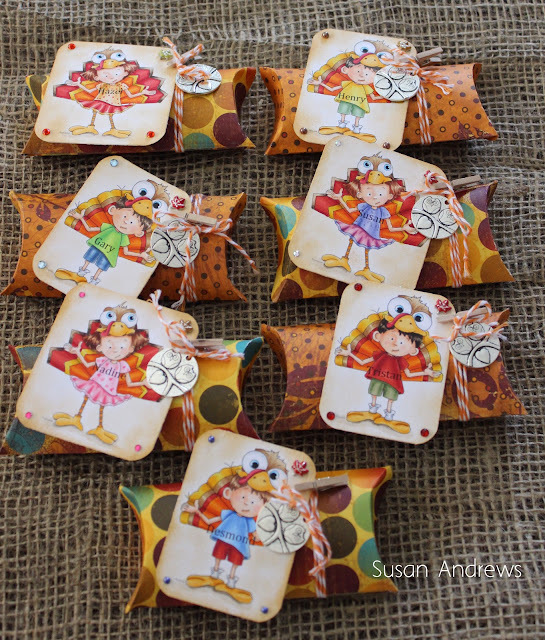 Today it is all about The Big Bag, a fun filled project which was a part of our quilt guild's year end wind up party. Not only was making this bag a blast but spending a full day at a bed and breakfast with the girls made for a good time. First off who can resist the meals being prepared, coupled with no clean up (a real no brainier in my book), combine that with a day of sewing, and woo who! Finally, a wind up dinner completed the day. Now, onto the bag, which was constructed with forty four, five inch squares. 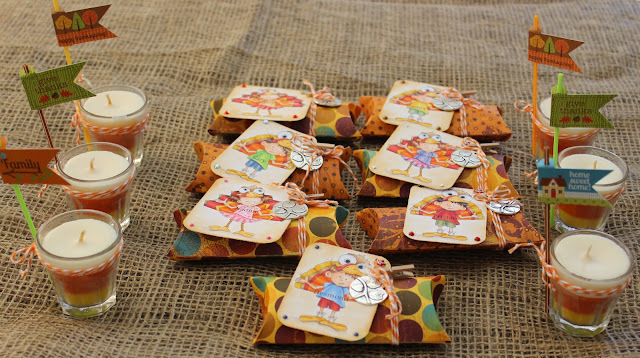 While several of the girls used the convenient charm packs which are precut to that precise size, I decided to raid my stash, in doing so I came across a lovely set of five fat quarters. Together the bright and cheery fabric, along with a larger coordinating piece (also from my stash) finished off the fabric requirements. As for the batting in this project we used a product called Soft and Stable which not only made for a single layer of batting but also provided an easy to quilt project, while giving the stability the bag needed, hence the name. At last to finish off the project we added magnetic snaps to the sides and front, which allows the bag to be pulled in or expanded when needed. 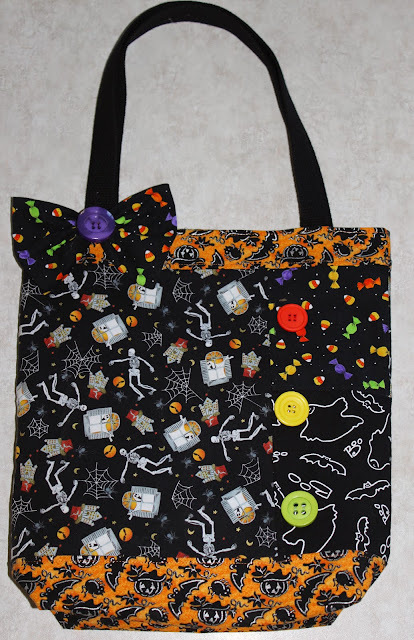 This is indeed a big bag that will come in handy; take it to the beach, pack a quilt project for class, also a possible shopping bag for those larger items, although there is a chance it may become a little too heavy depending on the goodies found. Over these past 18 months I have been on a health and wellness kick. First, I started out by wanting to loose weight and get in better shape. I was tired of feeling like I was going to have a heart attack every time I did anything physical, where even the smallest task seemed too much. Next, I knew my diet needed revamping, my goal was to cut out sugar and excess snacking. After a while I cut down on the wheat, as I am not overly sensitive to wheat I did not eliminate it completely. Well my program worked. I am down to an ideal weight for my height. Futhermore I excerise 5 days a week, my cardio is good and my muscles are becoming toned. It feels great. Along with my excerise regime, diet was an important factor. While knowing that the traditional diets only cause yo-yoing and determined not to let this happen again, led me to some amazing new cookbooks. 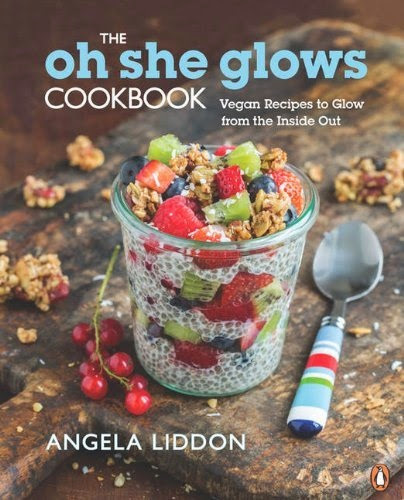 Amongst the few new books that I purchased my all time favorite is the "Oh She Glows" by Angela Liddon. Angela's book is a delight. Not only is there a photo for every recipe (which I love and many other books are missing) but the recipes are amazing, very tasty, and as added bonus my family loves them too. 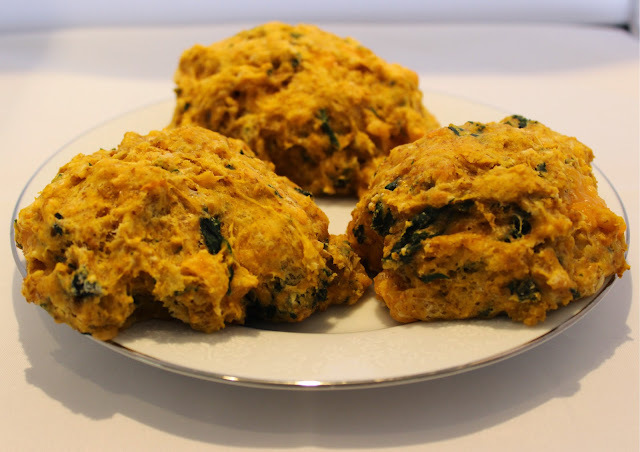 Additionaly she gives advice on how to adapt the recipe to fit your particular diet, whether being gluten free, processed sugar free, nut free and more. She also encourages you to try different flours, spices or other ingredients all the while letting her know the outcome. One other point Angela's book is vegan, but most of the recipies can be adapted to your own preference, throw in some chicken or fish if you like. I added an egg to her lentil walnut loaf and it held together beautiful. If you don't want to jump in and purchase the book right away, check out her "Oh She Glow's" blog. This incredible blog has many of the recipies from her book, great stories on how she came up with the recipies as well as lots of wonderful photos.